The first men's model (other than the Cushion) to not have a second hand was the 1936 Nolfolk. Like the Cushion, the Norfolk used a movement that was previously used in ladies models. All men's models had second hands until the mid 1960s. Then there were quite a few models without seconds hands. Sometimes they used movement that were in ladies models and sometimes they used men's movements with a modified 4th wheel with a shortened pivot. The last US-made model to not have a second hand was the 1969 Liberty Coin. 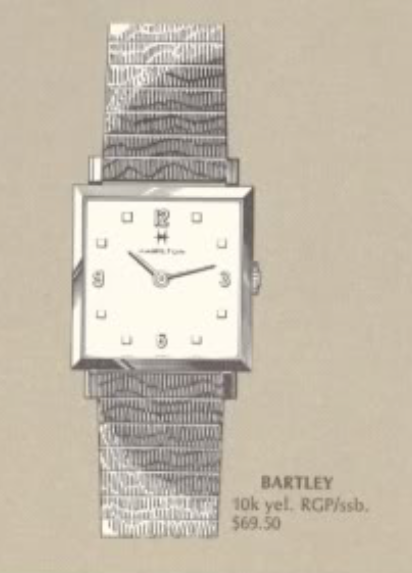 Still, there aren't that many men's models without a second hand and one of them is the 1966 Bartley. It was produced through 1969. The 1966 Bartley was the second model to bear that name. The previous version was introduced three decades earlier as the 1935 Bartley. The latter version bears no family resemblance and came in a 10K RGP case with stainless steel back. To look at it, you would probably assume it was a member of the Thinline series. I recently picked up a Bartley and it caught my eye because it also came with it's original bracelet. The lighting in my shop is good for working on watches but it doesn't do a good job showing just how filthy this watch was when I received it. The stainless steel back is unremarkable. The first challenge I faced was trying to get the bracelet off. The original spring bars had corroded in a seized mess and would not budge. Fortunately I can remove the movement while I soak the bezel and bracelet. Without the cracked crystal in the way, you can see the dial is actually in great shape. The 17 jewel Hamilton 681 movement is very small, about the size of a nickel. It's basically a modified version of the 673 movement based on a Swiss-made A Schild AS1200. The slightly blurry photo of the inside of the case back has two sets of numbers. The top number is a unique serial number for the case and the lower number is the model number. Notice it ends with 66, denoting it's a 1966 model. The movement gets stripped of all it's parts in order to be thoroughly cleaned. It took a while but I was eventually able to break the old spring bars without damaging the bracelet or the bezel. Everything gets cleaned and readied for reassembly. The first parts reinstalled are the train wheels. When everything is properly aligned the train bridge falls in place and all of the wheels spin with ease. Then I can install the barrel and pallet fork. A few winds of the mainspring and the reassembled watch is brought back to life. It's off to the timer to listen to it's ticking. Initially running a little slow, a quick tweak to the regulator brings the beat rate into alignment with 18,000 beats per hour. Almost there... it's running 5 seconds slow per day but the other specs look great. This watch cleaned up very well. I still need to locate a new crystal but that shouldn't be too hard to do. Removing the funk from the bracelet revealed a little wear to the outside edges of the links but it's not too bad in normal lighting. This watch is rather small, especially by today's standards but I'm sure there are plenty of men or women would be happy to wear it. I located a new glass crystal for the Bartley and I think it's a huge improvement... don't you?